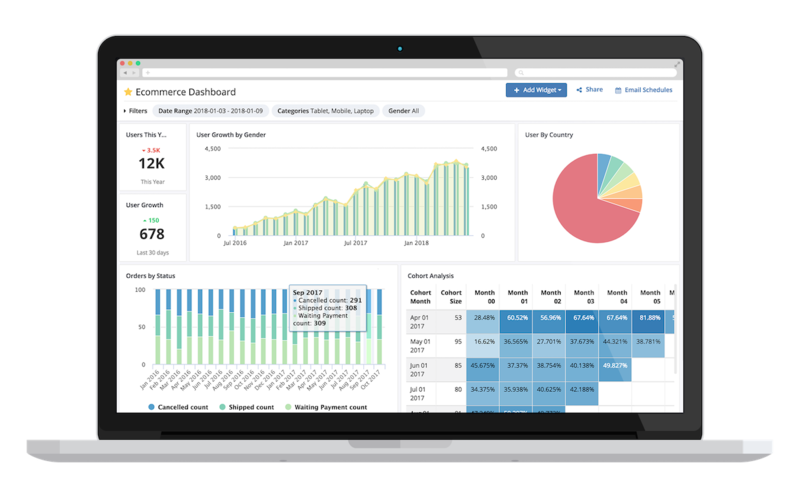 Build real-time, interactive dashboards with metrics and visualizations. Share and schedule your reports to be sent via Slack or email to your team. Powerful Data Access Permissions gets the right data to the right people at the right time! Built with Data Analysts in mind, Holistics provides a perfect workspace for you to analyze your data. Experience SQL on steroids, with our SQL Editor and customizable Query Templates for in-depth and flexible analysis. Perform Drag-&-Drop with our powerful Data Modeling feature. Connects to different data sources and brings all your data together into your data warehouse, using automated ETL. Sync up with CSV files, Excel or Google spreadsheets, MongoDB, MySQL, PostgreSQL and more. Automate the transformation of your data tables to improve query performance. From CEO, Founders, Product, Marketing, Sales to Analytics and Engineering. Data Management, ETL, Adhoc Queries, Automated Reports, Visualization. Connects Directly To Your Data Infrastructure (Oracle, SQL Server, Amazon Redshift, BigQuery, etc.). Only 15 tools out of 220 made the cut as FrontRunners, with top scores for Usability and User Recommendations. "Holistics believes SQL is the new Excel, and that in many ways, the people who know how to use SQL will find jobs in the same way masters of Excel were employed over the last couple of decades."